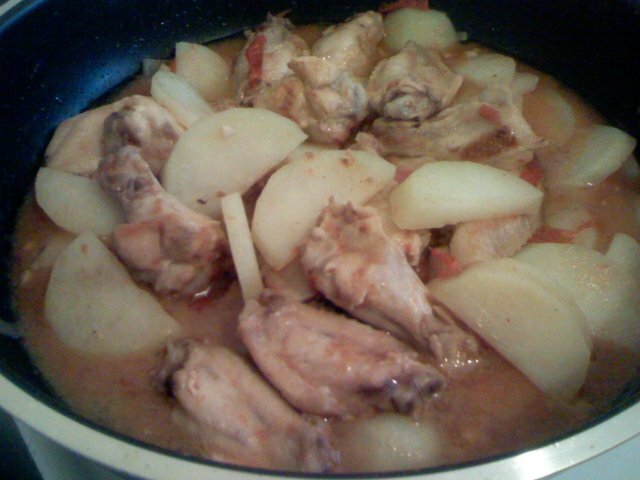 Afritada is one of our Spanish-influenced dishes and it involves cooking meat with tomato as the main flavoring agent, and the meat being either chicken or pork, or both. There are slight variations to this dish; for example, some like adding liver, raisins, or pineapple chunks, or green peas. These additions make afritada more colourful and tasty and is usually done for fiestas. This version however uses the most basic, no-frills ingredients for a regular day, but it is yummy all the same. (Oh, and if you have a piece of carrot, chop some up and add it at the same time as the potato. We ran out of carrots at this time but it should be part of the list). Pour in the water and add the tomato paste. Mix it up to dilute the paste. Add the potatoes and capsium. Season with salt and pepper. Have a taste and adjust with salt and pepper if needed. Pwede rin po ba itong lagyan ng green peas, Mr. Nick? Pwedeng pwede RJ. You can add this around 5 minutes after the potatoes are added. Huwag yung mint-flavoured green peas ha. We tried that before but the mint is overpowering.